What Diet Rules Can I Make for My Surrogate? As an intended parent, you want what is best for your future child. This involves a crucial step: selecting the woman who will carry your child for the first nine months of their existence. You know that every gestational carrier has to meet certain requirements before being matched with you — but what if you have other requirements you want your surrogate to meet? It’s completely normal for intended parents to have preferences when it comes to their gestational carrier. In many cases, your surrogacy specialist will work closely with you to match you with the perfect surrogate for your situation. Did you know that you will actively be involved in this search? That’s right — you will play a key role in finding the woman to carry your child. Intended parents have a lot of questions when it comes to what they can specify in their gestational carrier, but one request seems to be trending in the recent years. Can I set specific diet restrictions for my surrogate? In the article below, we’ve delved a little more into this topic. However, the best person to talk to about your particular surrogate preferences will always be your surrogacy specialist. Don’t hesitate to reach out today to learn more. Can I Request a Vegetarian or Vegan Surrogate? There are a variety of trending diets today: keto, Whole30, carb-free, and more. Two of the most popular are vegetarian and vegan diets. For various reasons — including ethical and health — an increasing amount of people commit to eating no meat or animal products in their daily diet. If you’re an intended parent who commits to one of these diets, you likely have plans to raise your child on the same diet as they grow up. It may also be important to you that you hire a surrogate who shares your diet preferences. Know this: It is certainly possible to find a vegetarian or vegan surrogate, but it may require extra work and patience on your part. As “trendy” as they may be, vegetarian and vegan diets are still fairly rare — only 5 percent of Americans are vegetarian, while 3 percent are vegan. For this reason, it will likely take longer to find a surrogate who already has this kind of diet restriction, as the percentage of women who choose to become surrogates is already low among the population. In terms of finding a vegan or vegetarian surrogate, it’s much more likely for you to be matched with a woman who already practices this diet than for you to matched with someone and then request they change their diet. A diet change such as veganism or vegetarianism is a big commitment; remember that many surrogates have children and spouses who may or may not be able to share those diet restrictions, and it can make her life much harder if she is required to completely change her diet when she is already giving up a great deal to be your gestational carrier. One of the best ways to find a surrogate who meets your diet preferences will be searching for one on your own. Working with an agency is possible, but it may take longer for your surrogacy specialist to find a surrogate who shares all of your other preferences, too. For more information on how many vegan or vegetarian gestational carriers work with American Surrogacy, please contact a surrogacy specialist today. This topic brings up another relevant issue: a surrogate’s overall diet. When you are an intended parent, you don’t have the degree of control over your baby’s development as you would if you were carrying your child yourself. 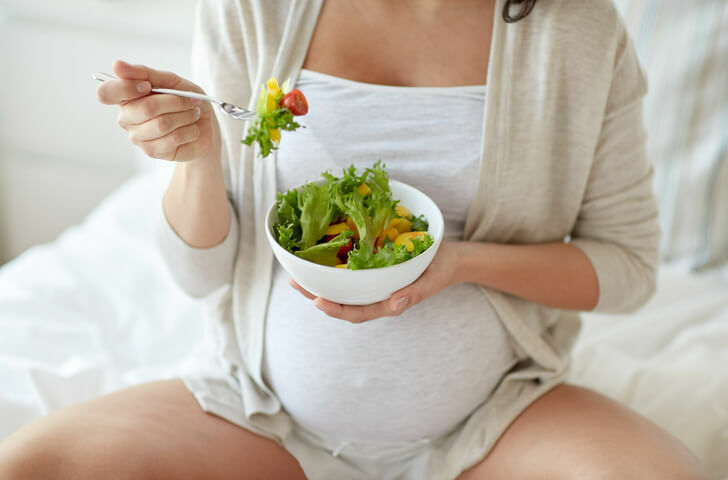 It’s normal to be frustrated and want to make sure your surrogate is having the healthiest pregnancy possible — which is why you may wonder what kind of diet and lifestyle rules you can have your surrogate abide by. When it comes to diet, there is one important rule that every gestational carrier must follow: Eat a healthy diet that promotes the growth of the child inside of her. This includes getting her daily servings of fruits and vegetables and necessary vitamins and minerals. It also includes her required prenatal medication. All of this is part of her “healthy pregnancy” and will likely be detailed in the contract she signs with her intended parents. Any additional dietary needs or restrictions will also need to be highlighted in the contract, as well — but the contract shouldn’t be the first time these issues are brought up. While they may seem small, these topics play an important part in the matching process. Your surrogacy specialist will make sure your match conversation with a potential surrogate includes your desires for her diet during pregnancy, which means a surrogate must be on board with these dietary changes before a match is even made. Then, the details will be solidified with your surrogacy contract. It can be stressful for intended parents to think about their surrogate’s diet and lifestyle. Often, it can be stressful enough that they wish to detail every “can” and “can’t” in a surrogate’s contract. However, remember that the woman who carries your baby is just as dedicated to your child’s health as you are. She likely will already have plans for a healthy diet and lifestyle during her pregnancy, which means you will need to have a certain degree of trust and faith for her decision-making as your surrogate. Micromanaging her life may put you at more ease, but it can also negatively affect your developing relationship. So, if you have any questions or concerns about your future surrogate’s diet and lifestyle, your first point of contact will always be your surrogacy specialist. They will always be the best person to explain their policy on these details and can help you find the surrogate that is perfect for your family-building journey, whatever your preferences may be. Next Next post: Thank You to Our Staff During National Social Work Month!